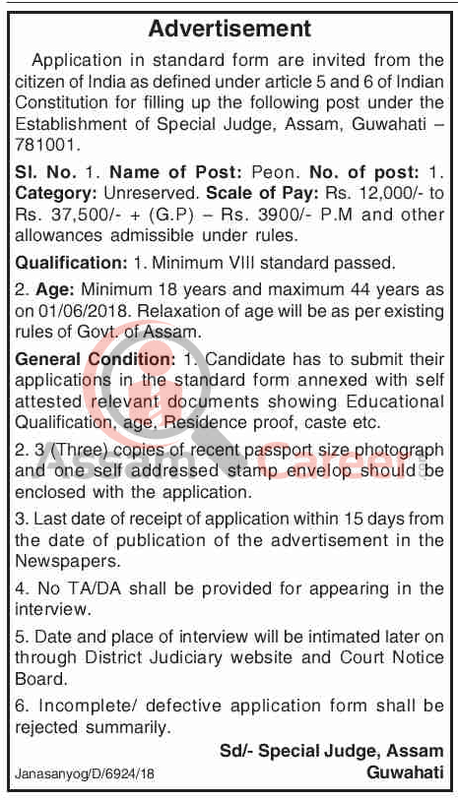 Application in standard form are invited from the citizen of India as defined under article 5 and 6 of Indian Constitution for filling up the following post under the Establishment of Special Judge, Assam, Guwahati —781001. Pay: Rs. 12,000/- to Rs. 37,500/- + (G.P) — Rs. 3900/- P.M and other allowances admissible under rules. Educational Qualification: Minimum VIII standard passed. Age: Minimum 18 years and maximum 44 years as on 01/06/2018. Relaxation of age will be as per existing rules of Govt. of Assam. How to apply: Candidate has to submit their applications in the standard form annexed with self attested relevant documents showing Educational Qualification, age. Residence proof, caste etc. 3 (Three) copies of recent passport size photograph and one self addressed stamp envelop should be enclosed with the application. Last date of receipt of application within 15 days from the date of publication [05/12/2018] of the advertisement in the Newspapers. Date and place of interview will be intimated later on through District Judiciary website and Court Notice Board.